Bad Decision #1 – Thinking you can do your roofing work yourself to save money. Replacing roofing is a complex job, despite how simple it might appear to be. Even experienced DIYers rarely get everything done right and usually underestimate the dangers involved. One missed safety step could take those few hundred dollars you saved and much more for a hospital bill and lost income. Unless you have a working knowledge of the various roofing components, including deck, underlayment, vents, soffit, fascia, and drip edge, you’ll be better off deciding to hire a professional roofing company. Bad Decision #2 – Going with the lowest bid without questioning why it is so low. 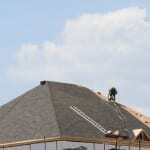 Choosing a roofing contractor based on price is rarely a good idea. If you get a bid that is exceptionally lower than the others you’ve received, there could be a scary reason for it. Bad Decision #3 – Deciding not to proceed with a new roof despite signs of damage. There are a couple reasons why this is a bad decision. First, prices are only going to be higher the longer you wait. Second, a damaged roof isn’t giving your home the protection it needs, which can lead to costly repairs, humidity issues, and mold in your home. Third, a damaged roof could be causing higher heating and cooling costs. Finally, a damaged roof won’t hold up in severe weather and you’ll be on a long list of other people in the same boat trying to get help from a limited number of roofing professionals. If you think it is time for new roofing and you want to avoid these three bad decisions, call us at Slippery Slope Roofing.